In the Diocese of Arundel and Brighton the Sacrament of Confirmation may be received by those who have reached the age of 14 (in practice, those who are in Year 10 at school may begin preparation). In our parish, the Sacrament is received together with the parish of Oxted and Warlingham in our church some time in the spring. Our catechists are led by Allison Pullin, and sessions take place on Sunday afternoons, before the 5.15 Mass, in the Old Hall. 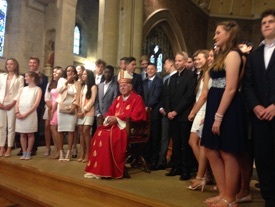 Bishop Francis Walmsley and the newly-confirmed in 2015. Note: this is a Saturday. Have to confirm this date and time.